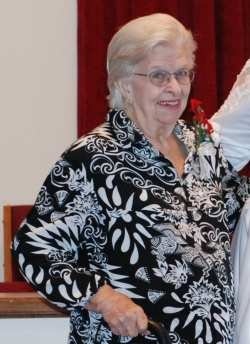 My grandmother, Pearl, better known to her HAM radio friends as N4SGJ passed away a few hours ago. In ham radio language, she became a Silent Key, or SK for short. I was lucky enough to have known all of my grandparents, and have had great relationships with all of them. My mothers parents passed away in the late 90’s, however my grandfather John, KI4SH (Pearl’s husband) lived until last October of 2007. Earlier this year my grandmother had a bout with cancer, but had whipped it, although early it looks like she passed away from a case of heart failure. Pearl was an avid sewer, she especially enjoyed quilting. My kids each have a quilt she made for them, and I still have the quilt she made for me as a teenager (camouflage with a blue back, very manly!). She always got a kick though out of the fact my kids “borrowed” it from me and use it as a snuggle blanket, refusing to give it back. She was also quite active in the ham radio community, having served as club secretary and been involved with several hamfests. I think one of the things I’ll miss though is her caramel popcorn. Every year she would make a big batch of home made caramel popcorn and give it out as gifts to all the family. I feel a bit sad, knowing this batch I have now will be the last I’ll get to enjoy, but I also feel privileged to have had her in my life as long as I did. My condolences on your loss. Sounds like she was a very special woman. You know, we didn’t get our caramel corn this year. Did you steal our share? Again? Not I @Dougal! I did offer to bring it with me when I saw her at the wedding, in hopes at having a shot at stealing it, but they didn’t have it with ’em and said they’d be mailing it. Has your mailman suddenly gained weight? We’re grateful that Susan got to speak with her on the phone last weekend.